Star Wars: The Force Unleashed II released on October 26, 2010, in North America; with a MSRP of $49.99 for the Wii version. 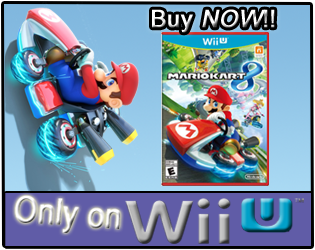 SW:TFU2, for the Wii, was developed by Red Fly Studio, and published by LucasArts. It has taken The Force Unleashed II 56 days for its game-play hours to appear on the Nintendo Channel, since its release. Do the reported game-play hours for Star Wars: The Force Unleashed II show, "The Force is strong with this one"? Let's take a look! How do you think Darth Vader would drink his coffee? 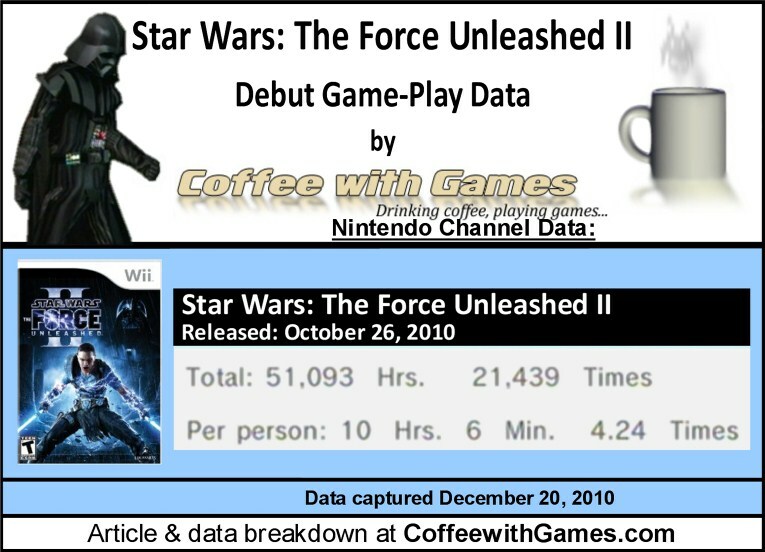 Star Wars: The Force Unleashed II has 5,056 Wii owners reporting their play-time hours on its debut, on the Nintendo Channel. 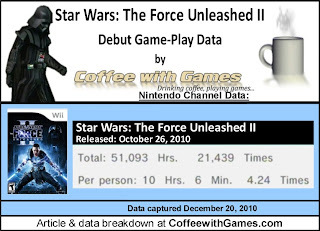 Star Wars: The Force Unleashed 2 has 51,093 Total Hours of game-play reported on its debut, with an average play-time of 10 Hours 6 Minutes "Per person" reporting data. The average play-time per session for The Force Unleashed 2 is just over 2 Hours 22 Minutes. Star Wars: The Force Unleashed II's Amazon.com sale rank is #269, and it is currently selling for $49.99. Star Wars: The Force Unleashed 2's review score average is 69.17%, based on 6 "professional" reviews on GameRankings.com. 501st Stormtroopers that didn't want to have a cup of coffee with me! I'm a huge Star Wars fan, but I have not played Star Wars: The Force Unleashed II. I really enjoyed the original Star Wars: The Force Unleashed, but after hearing how short SW:TFU2 is, I decided to hold off on purchasing it for now. I think considering the lower review scores, Star Wars: The Force Unleashed II has performed pretty well. The reported average hours "Per person" are higher than I expected them to be, and I don't know if perhaps the Wii version's local multi-player mode is helping that average. "My wife and I went out this year with our son. Saturday night, we dressed our son up in his dragon costume, but before leaving I snuck my old Jedi robe into my backpack, and strangely enough...it came to excellent use. We went to one of our malls, for a trick-or-treat event Saturday night with some other friends. We had gone into a store, and as we were leaving in our normal clothes...I saw two guys walk by in Stormtrooper armor. They didn't see us, so I called out, "Are y'all part of the 501st?" The guy replied, "Yea. How did you know?" I'm a huge Star Wars nerd, and know about the fans and the 501st Legion; so anywho, we chatted for a bit, and I ended up getting a picture with them while I was wearing the Jedi robe." Have any of you played and beaten Star Wars: The Force Unleashed II; and if so, how many hours did it take you to complete? If you played the original, how do you think Star Wars: The Force Unleashed II compares to it? Great pictures. :) I have fallen a bit out of touch with Star Wars fiction over the last several years - I had read dozens of the books back in college though and love the overall series. I really am digging Force 1 - Playing that now (though for 360) with Force 2 incoming from a friend to give to my son for Christmas. Still, my friend was not nearly as impressed with part 2 as part one. He kind of compared it to the disappointment he had felt for the Phantom Menace movie - it looks nicer than what came before, but seems to be lacking soul and depth. It seems a lot of people feel the same way as your friend, about Force Unleashed 2, compared to the first one. I had a friend that bought SW:TFU2 day one, and he felt really ripped off by the game. I've read many of the Star Wars books also, but haven't attempted to read any in a long while. Thanks for the comment! Anybody else have any thoughts on how the original Star Wars: The Force Unleashed compares to The Force Unleashed II? I played this on the 360. You may have read my comments on it a while back. 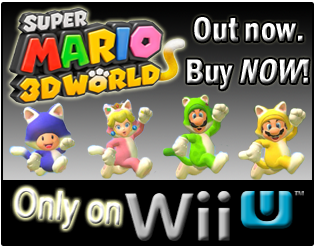 There was just something missing from this game that the original title had. The clone thing didn't bother me. The unanswered questions with no real chance of resolution will eat at me every time I think of this game. They also made Starkiller just TOO powerful. It stopped following the guidelines of the universe, and what was mildly cool at first, again, just bugged me later. I think I did read your comments on the game. My friend talked about Starkiller being too powerful also, and the final "boss battle" seemed really easy because of it. My friend said Darth Vader was shown as a weakling of sorts, the way they set it up.